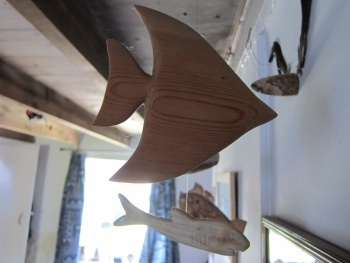 Eight fish hang from the ceiling, whittled from driftwood to pass the time one rainy west coast day. Nothing was ever bought new for the cottage. It’s full of hand-me-downs; things that became too worn for best would do just fine here, with a bit of tweaking. Old duvet sets would be reworked into curtains into cushion covers into napkins until, faded, thin and softened with age, they would see their days out as rags and dusters. I love this thrifty make do and mending because it’s so carefree and creative. The crockery doesn’t match? So what? 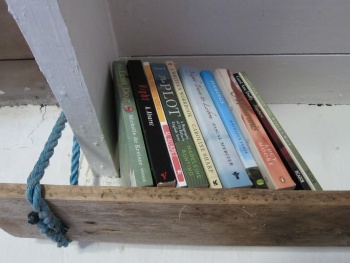 A bookshelf made out of driftwood and blue rope? Why not? With no style or fashion to follow, the cottage has been shaped by its surroundings and by the people who stay here. Beachcombing finds are woven into its very fabric – the fireplace is made from stones from the shore, a twist of bleached driftwood decorates the window sill and fishing rods hang from every rafter. 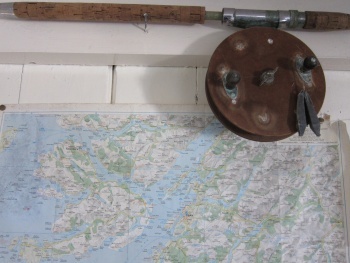 The cottage happily absorbs cast offs, finding space for multiples: two rusty sieves, three sets of aging barbeque tools, four teapots. My uncle Davy was a joiner and would bring treasures thrown out by his clients, including a shower, cubicle and all, that’s still going strong today. He once offered a conservatory in mint condition, but dad drew a line. In his eyes this was too much of a luxury for the cottage – along with a washing machine, electric blankets and, quite probably, the shower. So I’ve finally moved in and it’s not a holiday cottage for me anymore, it’s my home for a year. As I potter and settle, I’m temped to clear out the mismatching odds and ends and move in my more modern stuff. But that’s not the point and it doesn’t feel right to do it. The cottage is more than four walls and a roof. Everything in it has a history and each item holds a story, reminders of people and moments in time. I want to add to this and keep the thrifty holiday spirit alive. Although, having said that, the spanking new Ikea curtains do look great in the sitting room. And maybe in 20-years’ time I’ll be fashioning them into a tea cosy. Old fishing rods hang from the rafters. Now I have to work out how to use them. I did some proper foraging today and made gorse flower cordial. Gorse is rampant in these parts, splashing the landscape like bright yellow daubs of paint. On a still evening its heady, honey and coconut perfume fills the air. My recipe book says it’s best to pick the flowers when the sun’s out. No such luck – it’s been raining steadily since I arrived, so I just went for it. I boiled 600 ml of water with half a pound of sugar for about ten minutes. Then I took it off the heat, added the juice of one lemon and four big handfuls of gorse flowers, stirred and left it to stand for five minutes before draining it through a jelly bag. I now have two jars of summery smelling syrup, although one has a suspicious undertone of spicy tomato chutney – the jar’s original contents. Well, it’s all learning. I’m going to try the same thing with clover when it’s in bloom. I also enjoyed fat scallops, langoustine tails and the sweetest clams today courtesy of the very nice fisherman on the pier at Tarbert. Now I’m off to the marina to beg use of its wifi. It seems that getting broadband installed here could take longer than I thought – I need to get planning permission for a new telephone pole first. Who’d have thought? And thanks to my friend Cath for the photos.